Yesterday was the 12th of August, also known as the ‘Glorious 12th’ or a catch becoming increasing used: the ‘Inglorious 12th’. The day refers to the beginning of the shooting season for red grouse when over the next few months areas of upland moorland will be used to practise the so called ‘sport’ of driven grouse shooting. The date is a symbol for how many grouse will be shot on the uplands over these next few months. For many, it also represents the ways in which the areas where the shooting will take place have been intensely managed to enable the season to be successful and the practise enjoyed by that very small minority. From the burning and draining of the moors to allow suitable conditions for the heather to grow, to the management of predatory species such as stoats, foxes and raptors. This is all in order for the red grouse to thrive so, ultimately, they can be killed for some fun, games and profit. I was in London yesterday on a march named as ‘crush cruelty’. It was very similar to other marches that I’ve been on in London and in other parts of the UK. For example, those against the badger cull, the Hen Harrier Day events I’ve attended, anti-fox hunting demonstrations around the time of the election and so on. However, this one was slightly different. Instead of there being one quite specific reason for being out on the streets of London and outside Downing Street, this one was broader. At each of the events and marches I attend, there is normally a few of the same faces that I recognise. Of whom, seem to have their own specific focus on what they campaign for. But yesterday, there was a real contrast of those that I’ve met and seen at all kinds of previous events in one place. Whether these were individuals, those who work for charities or organisations, well known faces, and the list goes on. This was something extremely refreshing and excellent to see. At the end of the day, although we all have slightly different focuses or issues we put more time into, we all care, are passionate and deeply concerned about the future for wildlife here in the UK. And there will always be many more of us then any of those who practise the activities of harming or threatening it, whether that’s those who support cruelty to wildlife, the badger cull or those who still consider shooting and fox hunting as ‘traditional’ and acceptable. 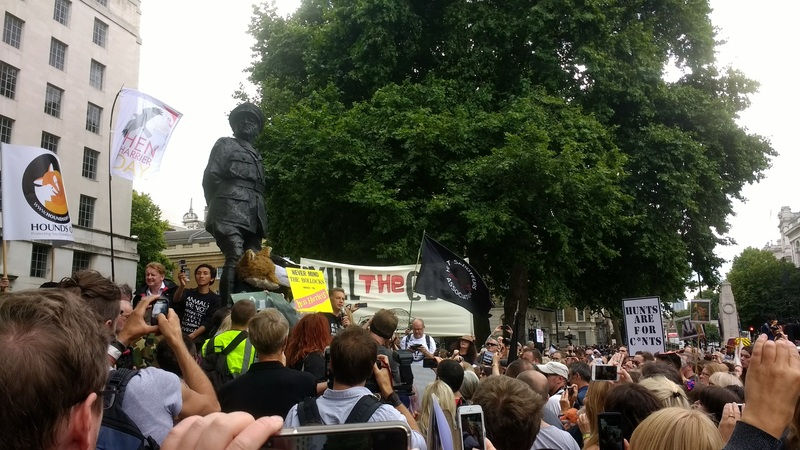 It was an excellent day, the only glorious in the ‘glorious 12th’ yesterday was the sight of 1000’s making their way through the streets of London, having an impact as they did so. Since I first got involved with campaigning and attending marches and events, I always noticed the difference in those faces I recognised at the different events I went to. It made me think how great it would be if we all joined together in the form of a rally or worked together more in the form of a coalition as ultimately, we all want the same thing. To see the force of those fighting for this is frightening the hell out of those who are desperately gripping onto their practises and their slaughter of our natural treasures, which they believe is acceptable. In terms of politicians and those in power, they are already beginning to notice how what they say (and don’t say) about protecting our natural environment will put their jobs at risk. The Conservative Parties result at the last election is a clear example of this. 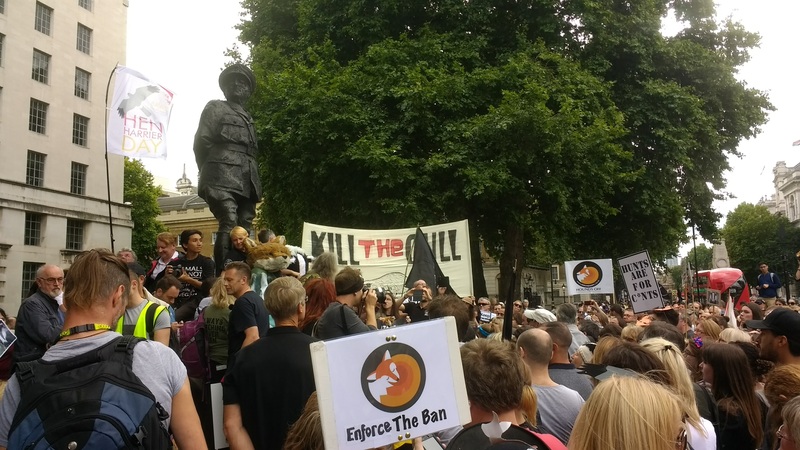 Theresa May promised a free vote on the Hunting Act, and this went down very badly. Many believe that this promise damaged and helped to result in her outcome of not securing a Tory majority. Which isn’t surprising as it was revealed that fox hunting was one of the few policies in the Conservative manifesto that people could remember. Unfortunately, most politicians are still pretty hopeless at bringing up such topics that relate to protecting the natural environment. On the other hand, it was great to see Natalie Bennett in full force and talking at yesterday’s rally in London. She is undoubtedly a superb spokeswomen for anything that concerns the issues that we were fighting against at yesterday’s march. 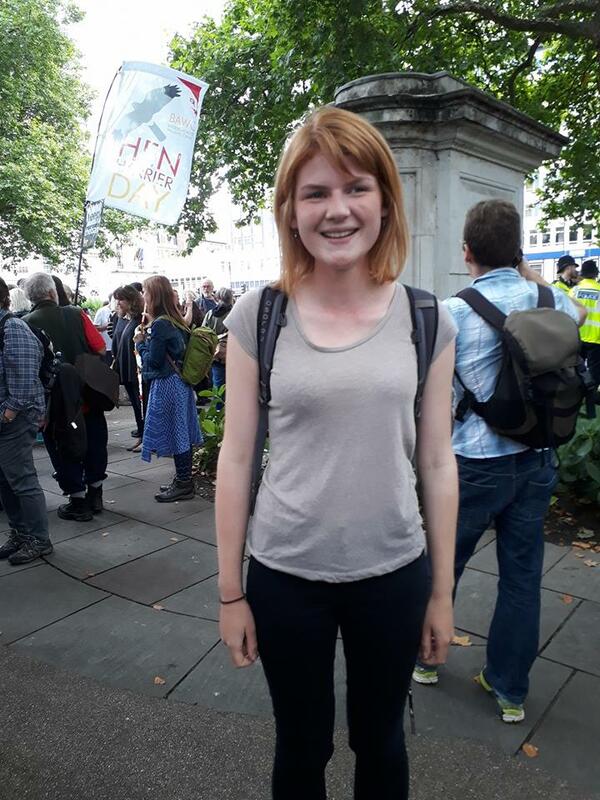 She has given up a great deal of her time and effort, in fact, just last weekend she was up in Sheffield speaking at one of the Hen Harrier Day events. There were many similarly inspiring and incredibly hard working individuals speaking in London yesterday too. A real array of some of the finest conservationists and campaigners in the UK. Others included Mark Avery, Hugh Warwick, Dominic Dyer, Will Travers, Chris Packham along with individuals from the League Against Cruel Sports, International Fund for Animal Welfare (IFAW), Hunt Investigation Team and so on. The day felt very special in terms of all those who had come together and the coalition of so many influential, inspiring and important individuals, charities and organisations. There’s been a great deal going on in the last week on social media and in the run up to the Inglorious 12th. Some of this includes the Hen Harrier Day events last weekend, videos and podcasts released throughout the week, a monstrous thunderclap that went out yesterday morning, news on more positive work with Hen Harriers and the Ethical Consumer campaign asking companies to distance themselves from the practise of driven grouse shooting. Details and links about all of these are below. Along with this, as the next few weeks go on, I’m sure this will keep up and as we approach the start of the badger cull, which is due to begin over the next couple of weeks. A Youtube video from last weeks HHD at RSPB Arne. Being at yesterday’s march was a bit of a contrast from the scenes I’ve been used to over the past few weeks. From my remote few weeks on Fair Isle, the wilderness of the Yorkshire Dales and isolation of the Pennines and tranquillity on the east coast and at Spurn to the craziness and hustle and bustle of central London. I’m now looking forward to the next few days with the Field Studies Council at one of their education centres (Preston Montford) where I’ll be helping to run wildlife related workshops for young people. Loved your blog Georgia and am in agreememt about tthose who seek to destroywildlife with no thought should be banned from the moors. Unfortu ately thepractice of burning the heather and shooting in those parts has been going on for many decades. I grew up near the imfamous Forest of Bowland . It seems, and please correct me, that a new elemnt has grown up amongst the hunting fraternity . They are the ones who seek ultimate profit amd dominationof the Northern moors and who are backed by thesame people who espouse neoliberalism ie greed and power at ANY cost. They have no care or links with locals other than to destroy their enjoyment of THEIR countryside. I don’t think hunting will stop altogether but wildlife which lives there needs protecting, both flaura and fauna. Love your blog as usual. It is brilliant that you manage to get to all of these rallies. I enjoyed the video of Natalie Bennett’s talk.She seems to pitch it just right and I was shocked by Chris Packham’s statistics about loss of wild animals and birds since 1970 and 1975 respectively. The problems seem to be speeding up to me now just judging by my garden this year. It is excellent that the events were so well attended. My concern is the way people in the public eye are being abused and reviled for stating their views and beliefs. I so hope your results are good and that you enjoy the next stage of your education, I feel that people are beginning to get the message now. Hope I am not wrong, well done to you. A wonderful post that perfectly captures the politics of cruelty. Please keep on writing and shining a light on this murky world of money and murder. It`s great to see someone so young taking such an interest in these things….you`re awesome Georgia. Really informative and captures so much about the importance of campaigning and the knowledge we gain from meeting up with others and sharing. I became a member of the Green Party some years ago as a way to support change for nature but from abroad but it keeps me connected and involved in what goes on in the U.K.